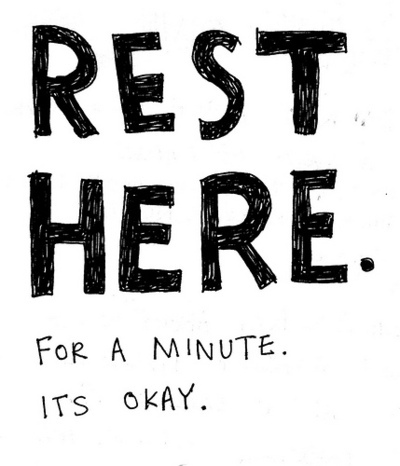 Take your moment of rest, you deserve it! I found this on Tumblr not sure of origin. While I am not quite having a “Calgon take me away moment” ( I mean seriously the agency that created that is so brilliant, although I am not sure it helps to sell more product, but there is something to be said for good branding and a catchy tagline), I am having a bit of tired moment. Usually this is driven by things that are less physical than emotional but are certainly compounded by all the things happening in daily life. I crave rest, not the kind where you are at home at the end of the day and pass out on the couch like I did last night, but the kind where you feel good for being able to sit down and read a magazine of possibly take an afternoon nap. I knew this had all come to a head for me last night when I got a text message at 7;45 from my friend D who asked me if I was on my way to dinner. What?! Dinner is tomorrow night?! Apparently not. In the chaos of everything in life, I had arranged a sitter and planned my meeting schedule around a dinner today that was actually last night. So, since having sadly missed the dinner with some of my great friends and former colleagues, and subsequently having shared the news with KSP when he got home and then promptly passing out on the couch at 8:30 watching Rachel Zoe (guilty pleasure), I realized perhaps I am in need of some rest. Which then led me to reflect on all the conversations I have with so many people everyday and I realize it seems like noone rests anymore…almost never. Things are busy all the time. It seems like everytime I speak to a friend or family member, male or female, mom or not, dad or not, everyone is jam packed in their life. With kids you try to find the balance for them, for you, for all of you between family, work, activities, friends, and self. Without kids, you are a different kind of busy still trying to find a balance for you, your family, friends, work and activities. Full, full, full. Then you add in all the life stuff like groceries, cleaning, dry cleaning, finances, auto upkeep, house repair, etc. and when is there ever time to rest? Studio execs seemed to be surprised when the film “I don’t know how she does it” with Sarah Jessica Parker was a flop at the Box Office. Well first off, everyone is busy. And whatever is happening on screen is all of our lives everyday. Then add the fact that SJP while very nice and lovely, has several nannies to help with her brood of wee ones and that then makes the film slightly irritating. Add to that from my own personal vantage point as a woman with two wee ones one who has some special issues, I have a complete disconnect with the enjoyment I might get from at least seeing what she is wearing in the film. I cannot lie, from the trailers her wardrobe did look fabulous. But this is the non-rested Shannon typing, so let’s get back to my point which is that we all as people, parents, friends, family members, employees, friends, juggle constantly. Most things don’t ever reach the surface of our conversations as these are the things we just have to do, but with all of this we all need a moment to rest. Today, as I sit here typing, I am wishing you all a moment of rest. I too will be taking my moment today at some point which I don’t yet know, but it doesn’t matter, it must happen. With exerting ourselves and knowing the value of rest comes relief and recentering which is good for you, your loved ones, your pets, the drivers around you, the people that help you at the grocery store and the list goes on. Happy ‘newfavoriteday’ and enjoy your moment of rest, I know I will too! Reading this has me thinking I ought turn off my computer and actually rest, having been up and at it since 5 a.m.! Just one more post! Then I really will do it and take a moment to revel the peace of stopping. For a moment.